The Point Reyes website is limited in space so I’m posting info here for anyone who is interested in this weekend event, which is only offered once per year. Are you getting older? We hope so. But how to age as gracefully as possible? You love the outdoors! You’d rather be outside than in a gym. If you’ve ever considered consulting with a fitness coach or personal trainer, this is an excellent way to get started in understanding how to weave fitness into your life so that you can continue to enjoy your outdoor activities. This retreat is designed so that each participant can connect with nature, rejuvenate and experience a variety of classes and activities specifically designed to help you maintain your ability to enjoy the outdoors. Together we’ll enjoy Point Reyes and learn transformative skills focused on improving and maintaining your skeletal structure and quality of life. The weekend will include structured classes, group movement and exercise sessions as well as a variety of health and wellness discussions. Participants may enjoy all or some of the activities. Learn and practice skills and progressive routines to enhance your health as well as optimize, personalize and PROGRAM your fitness. 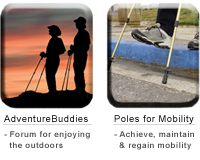 Expert instruction will help you improve your ability to hike efficiently and comfortably using poles. A variety of top quality poles will be provided – learn which model fits you best and will enable you to achieve your hiking goals. Weekend rate includes two nights’ accommodations and most (healthy and delicious) meals. Hikes: Saturday’s short hike is part of the hiking poles training. Sunday’s hikes: 2 levels will be offered (easy/gentle and stronger/exercise) so you can practice skills and experience the magic of Point Reyes. Most retreats at Point Reyes run well over $400 and do not include the food. This one is $315 (members) or $345 (non-members) and includes most of the food – see note at end of this post to see how you can experience a truly magical culinary experience as well as the training and camaraderie of this retreat. Activities and times are approximate and subject to change due to weather or whim. • 11 to 12:30 Unload car, sign in with facilitator, get parking pass and repark car in nearby lot. Select cabin, arrange bedding. Settle in, lunch on your own. Six key elements determine your ability to maintain physical fitness. This interactive session progressively helps you create a more structurally-solid foundation. Individualized movements focus on improving joint health, balance, posture, endurance, flexibility and strength. This is a combination lecture and participation which will give us a common language for the weekend and give you tools for establishing a healthy exercise routine. Participants will be able to assess their level in each category and learn movements and exercises in each that will help facilitate optimal physical health. Extremely easy, low to medium level of exertion. • 7:00 Hiking Poles lecture, anatomy discussion and pole fitting (gearing up – variety of quality poles provided). Learn which poles fit you best and will help you achieve your goals. • 8:45 Hiking pole training session and short hike (< 2 miles): Beginner to experienced hikers learn techniques which help improve performance on the trail. Optimal use of poles on uphill will improve your power, endurance and spine function; on the downhill, you’ll develop skills for improving confidence and saving your knees. • 8:30 Practice Pole Hikes: Weather Permitting – Enjoy nature and experience the magic of Point Reyes. Two levels offered (Easy, gentle, nature hike or more energetic exercise training hike). Facility: – See description on the Point Reyes website Scroll down to read about the Clem Miller Environmental Education Center. There are 5 separate cabins, each of which sleeps over 20 and our retreat will be under 20 people total, so it’s 3 to 4 people per cabin. We have LOTS of space! • Hat and sun protection. • Good quality hiking shoes (with tread). • Rain gear, if necessary. • If you are lacking any of the above, let instructor know as Jayah has extra of almost everything. When in doubt, pack extra. – Your favorite small piece of exercise equipment. Be creative, as we’ll be sharing our success stories. our system is UNIQUE (and, if I do say so myself, brilliant) at Point Reyes, but it requires a little up-front coordination which, in the long run, will save you a BUNCH of time and trouble. Meals are coordinated ahead of time via a website that makes the food for the weekend easy, creative and fun. Rather than having to prepare all your meals for the whole weekend, you will be able to bring 2 to 3 items plus a few staples. This easy and well-organized website will enable us to see what everyone is bringing as our culinary experience unfolds. Our focus is on healthy, nutritious, yummy meals that connect us as we share stories and enjoy health-related discussions. You will be able to contribute in a way that you’re comfortable, whether it’s a main dish, side dishes, snacks or staples (which will be listed so all you have to do is sign up for that item). A full-service, commercial kitchen is provided. Participants will need to advise the instructor of any food allergies or limitations. IMPORTANT NOTE FOR REGISTERED PARTICIPANTS: Instructor will want to reach out to you 2-3 weeks before the class so you can get the custom and updated list of what to bring as well as prepare your food contributions. WHEN YOU REGISTER, you will want to ask the field seminar office for the instructor’s email so that you can reach out and receive the info you will need in order to participate in this retreat. The sooner you reach out to the instructor, the easier it will be for you to prepare.